'Immersing this diverse group of NSW based startups in the Indian innovation ecosystem is a sure way to drive innovation and creativity,' Minister Blair said. 'The exposure and specialist mentoring they’ll receive on scaling a global business makes the sky the limit for creating high growth companies. 'Thirty eight per cent of startups headed to India are based in NSW regional communities, 35% are women, and they represent a diverse mix of tech solutions seeking a global market. 'These emerging entrepreneurs will learn from India’s best and brightest, gaining direct access to global leaders in innovation who can guide their businesses in dynamic and fast developing technology markets,' said Minister Blair. SSE’s Education and Training Director, Jonathan Jones sees huge potential for the school’s next International Bootcamp to the thriving Indian innovation centres of Mumbai, Bengaluru, Pune and Ahmedabad. 'Connecting 33 rising stars with dozens of globally successful Indian startups and multinationals in four global Indian cities is a remarkable opportunity,' said Mr Jones. 'Through SSE’s network of 12 member institutions and partners we’ve reached startups from every corner of the state, with new business solutions ranging from using AI learning in chicken farms and worm farms, to documenting community history. 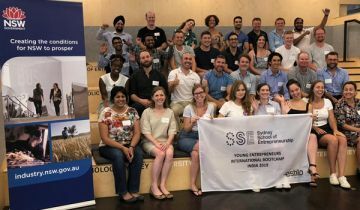 'The shortlisted 33 participants will take an SSE Masterclass on doing business in India then begin the 10-day bootcamp connecting with India’s diverse startup ecosystem,' said Jonathan Jones.